Warm weather will continue Tuesday evening and the air will cool off to “mild” for the morning commute. CINCINNATI, OH (FOX19) - Warm weather will continue Tuesday evening and the air will cool off to “mild” for the morning commute. Dry weather continues until Thursday afternoon when scattered showers begin to develop in advance of a strong cold front heading our way. During the late evening Thursday and the overnight into Friday early morning rain could be heavy and there is a small chance of a severe storm cell or two. 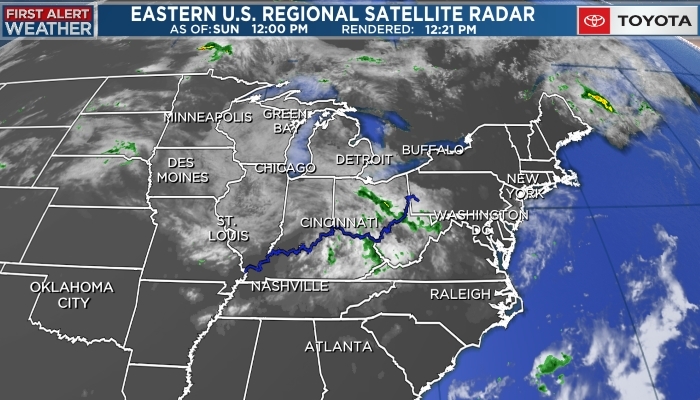 Behind the front chilly showers will dominate Friday and Saturday with the rain finally moving out of the FOX19 NOW viewing area before dawn Sunday. Sunday slow clearing will allow enough sunshine through the clouds to push temperatures back into the 70s. Dry Warmer weather continues Monday but showers return Tuesday.